Ladies and gentlemen welcome to the fashion pages of Confessions Of A Trolley Dolly. Forget Vogue, forget GQ, our Style In The Aisles section is THE place to get all the latest aviation fashion news and reviews. Flying and glamour have always gone hand in hand. Ever since the first flight attendants took to the skies, all eyes have been on what the girls and boys are wearing. 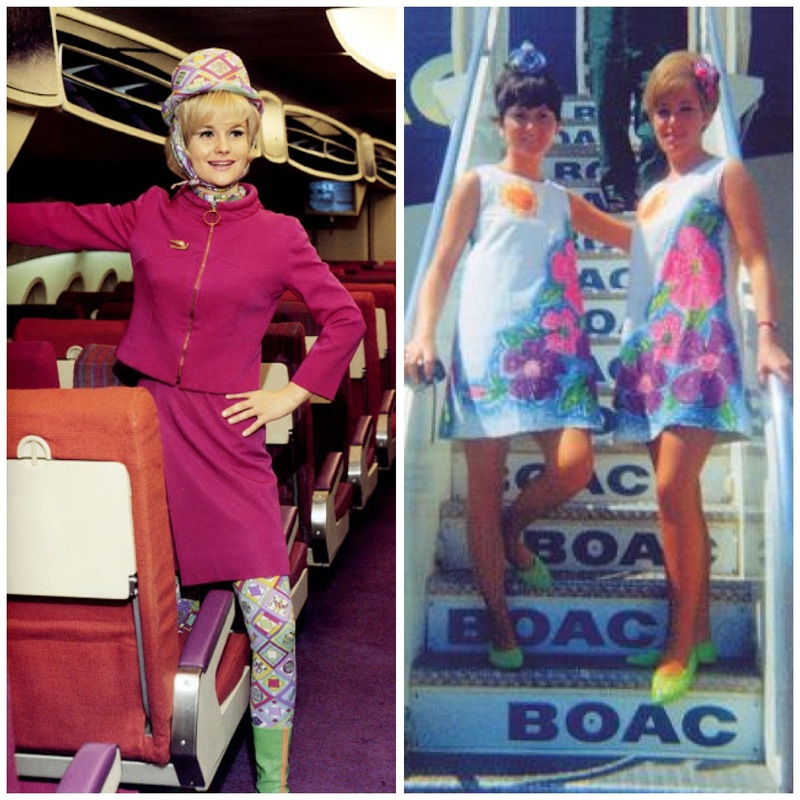 From Pucci prints at Braniff, to paper dresses at BOAC, over the years airlines have come up with some iconic looks to style their crews. Sadly during the 80’s and 90’s many uniforms went from glam and fabulous, to drab and utilitarian. From Pucci prints to paper dresses. Recently, all this has changed and high-end style and glamour is finally returning for us trolley dollies. Uniform designs are now coming from top fashion houses and home-grown design talent, as airlines around the world tirelessly compete to make their girls and boys look their very best. Here we take a look at 10 of the best cabin crew uniforms that are currently gracing aircraft aisles and airport terminals around the world. 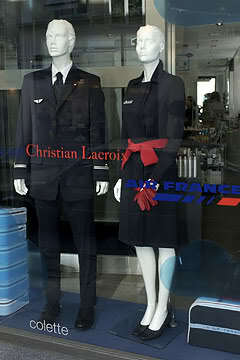 The ever stylish boys and girls at Air France simply had to feature on the list, as their current uniform offering is most definitely ‘Bringing Back The Glamour’. Created in 2005 by French haute couture design legend, Christian Lacroix, signed pyjamas by the man himself are handed out to passengers lucky enough to travel in the airlines First Class (L’Espace Premier). The stunning pieces, especially for female crew, hark back to the glamorous jet-set era of the 1950’s and 60’s. 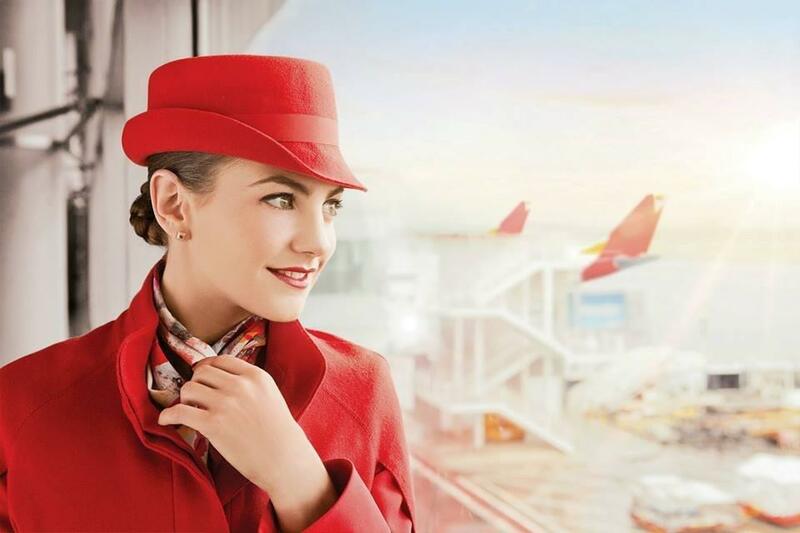 There are a variety of outfits to choose from, including leather gloves and a fabulous scarf, all in the airlines classic blue and red colour scheme. Top of the selection has to be the gorgeous fitted dress. Offered in either pale or navy blue, adorning the front is an oversized red bow that really sets off the piece, a dress which would not look out-of-place in Carrie Bradshaw’s wardrobe or on a stylish French Mademoiselle, wandering the streets of Paris. As the UK flag carrier, it’s only right that British Airways (BA) dollies are kitted out in an amazing uniform and in 2004, the airline joined forces with ex-Chanel and Givenchy designer, Julian MacDonald to create just that. After styling some of the worlds leading stars including Liz Hurley and Kylie Minogue, it was his task to spruce up the previous incarnation, designed by Paul Costello and worn since 1992. 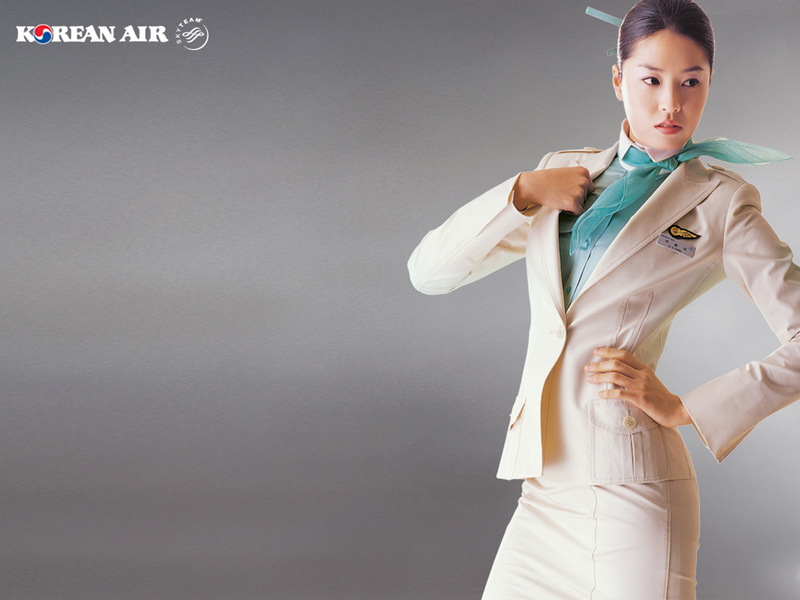 “I wanted to create a uniform that puts the glamour back into flying. It couldn’t be any worse than the one they’ve had for years”, MacDonald told the media at the official launch of the new design. “The old uniform made the cabin crew look like someone’s old granny queuing for a bus, because it was so unflattering”. OUCH! Worn by over 25,ooo crew and ground-staff, the design reflects the traditional British heritage of the airline, with a classic pin-striped, wool-mix, tailored suit; plus added extras such as branded cufflinks for the boys and striking red lining. 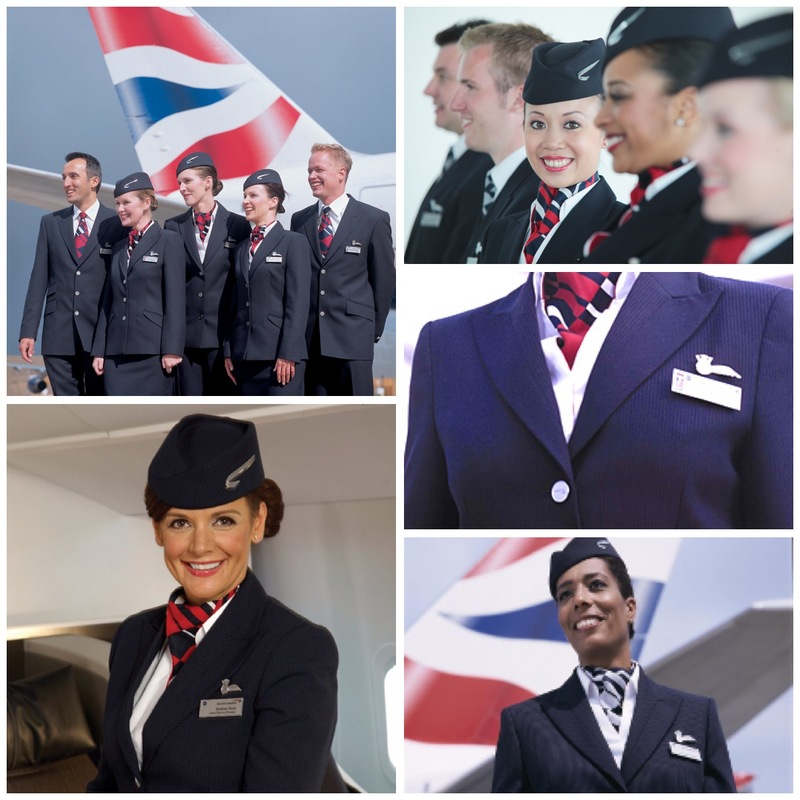 “Our uniform is one of the most powerful symbols of the British Airways brand and it is important that our staff feel proud to wear it on the ground and in the air. The new uniform is succesful at reinforcing our identity – professional, reassuring and proudly British – a quality brand that is recognisable around the world”, said Steve Harrison, BA area manager for Middle East, North Africa and Central Asia. The uniform was further updated when BA introduced its ‘mixed fleet’ operation. A stylish and traditional hat, created with top milliner Stephen Jones, was a welcome addition. This was complemented by further accessories such as a leather handbag, matching belt and leather gloves all designed by British leather goods specialist Tanner Krolle and worn by the 17,000 female staff. In 2018 it was revealed that Saville Row tailoring expert Ozwald Boateng OBE would be redesigning BA’s iconic uniform to celebrate the carriers 100th Birthday in 2019. Stay tuned to Confessions of a Trolley Dolly for more details. For more information on British Airways check out our ‘A Day in the Life’ of BA CityFlyer crew. In 2013, when the Australian national carrier announced they would be redesigning their crew uniforms, the aviation world waited with bated breath to see if Qantas would still be using top designers such as Pucci and Yves Saint Laurent, as they had in the past. Needless to say they were not disappointed. 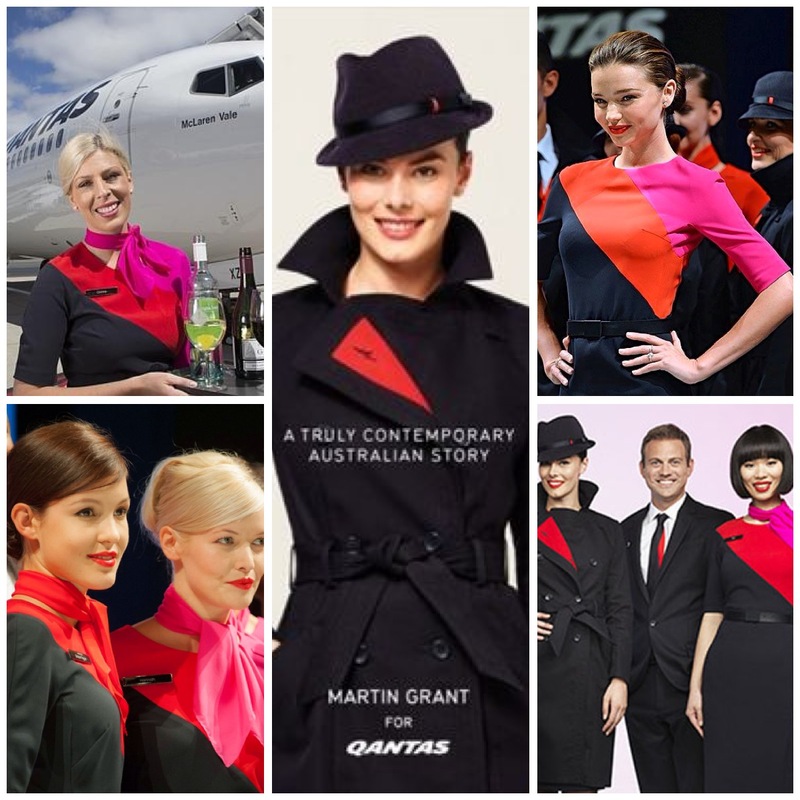 The new collection, full of striking colours, including French Navy, Qantas/ruby-red and fuchsia palette, was created by Australian born designer Martin Grant, the tenth Australian designer Qantas has worked with since the airlines launch in 1938. The capsule design of the uniform means that crew have 35 items to choose from. Signature piece is the bold stripe dress, designed to flatter all body shapes and make the airlines crew really stand out, either onboard or on the ground. Also returning is the traditional flight attendant hat, in a very stylish Trilby design, plus a stunning red lined trench coat. Speaking about the new uniform, a Qantas spokesman said “Our new uniform is so much more than a new look, it marks a new chapter in our brand and will unite our people of the ground and our flying crews as one team”. When one thinks of stylish flight attendants, easyJet would never normally be an airline that springs to mind. However, in 2013 the UK’s largest carrier teamed up with designer Jeff Banks to give its crews a much-needed make-over. A far cry from the orange puffer jackets, black jeans and ‘I’m an easy crew member’ slogan t-shirts of their early years, the airlines trolley dollies now look uber-professional. For the boys, a smart three-piece grey suit comes with a newly designed waistcoat and funky tie. The girls have the choice of two dresses, teamed with stylish new leather handbags, a longer two-tone orange scarf and orange leather heels. The new pieces are in addition to the redesigned uniform, introduced in 2007 and designed by easyJet’s own cabin crew. easyJets new uniform is a far cry from the orange shirts and puffer jackets they used to wear. Angela Mullen, easyJet’s Cabin Crew Service and Standards manager said “We are absolutely thrilled with the new easyJet cabin crew uniform. Our crew are the face of the airline and it’s essential that they look and feel professional, presentable and confident in their uniforms every time they wear them. The new additions are stylish yet practical enabling them to go about their duties comfortably and I’m sure they’ll be worn with pride”. Definitely one of the best transformations on our list and for more information on the airline check out ‘easyJet -Turning Europe Orange’ picture gallery. 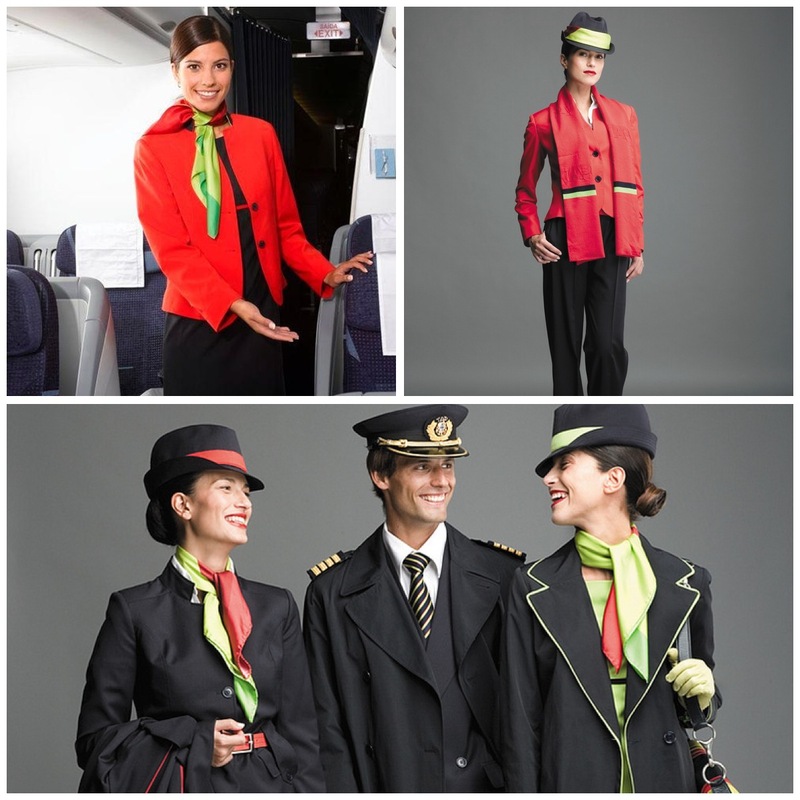 Introduced in 2006 to celebrate the carriers 60th anniversary, along with a brand new livery for its fleet, the current incarnation of TAP Air Portugal’s crew uniform, is one of the most bold and colourful of any cabin crew flying today. The airline chose Portuguese designers Mauel Alves and José Manuel Gonçalves to create the new look, highlighting TAP’s ‘Portuguese-ness’ and reaffirming their status as the countries national carrier. Speaking about the design, Manuel and José said “The concept to be developed should provoke creativity and not portray the idea of uniform, but flexible work clothes to allow each person to maintain their own image, but not stray too far from the original concept of the company itself”. The uniform is designed to be elegant and stylish, whilst also being comfortable and functional. Another airline to use the capsule design, there are a range of pieces for staff to choose from. This includes, for the ladies Trilby hats, green or red leather ‘driving’ gloves, a classic long and colourful scarf; a choice of green, red or grey dresses and my personal favourite, the knee-high come f*@k me leather boots, although I’m not sure how comfortable they would be after a long busy flight. 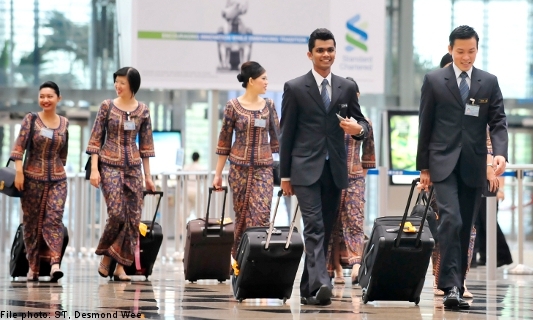 Singapore Airlines world-famous ‘Singapore Girl’ uniform has barely altered in over 40 years. But as the saying goes, ‘if it ain’t broke, don’t fix it’. The outfit is elegant, stylish, traditional, instantly recognisable and therefore one of the most iconic cabin crew uniforms in the world. 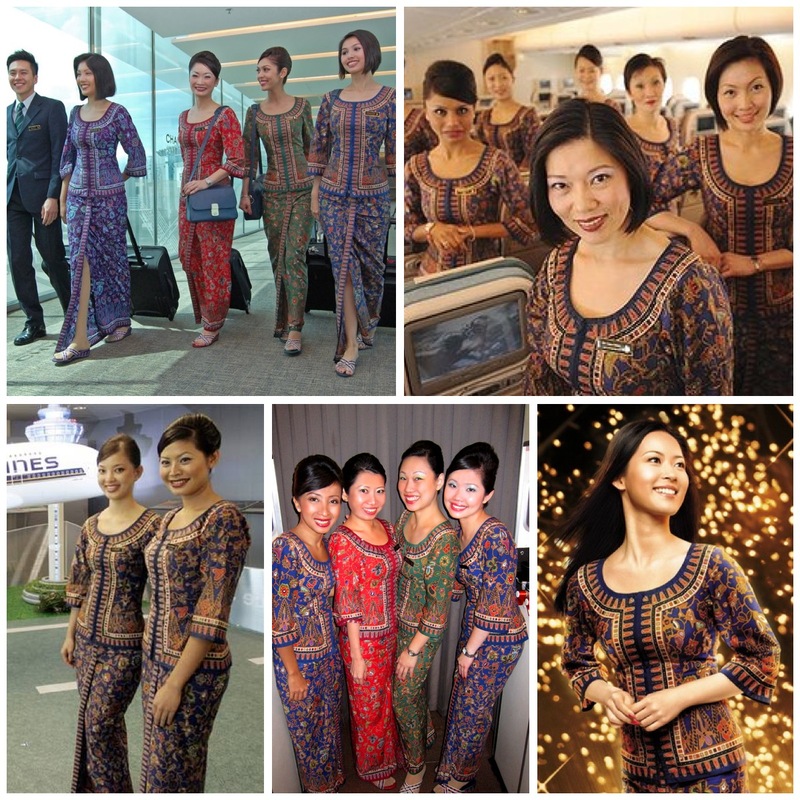 The original, a take on the traditional ‘Sarong Kebaya’, was designed by French couture designer Pierre Balmain in 1968 and rolled out in 1972, after Malaysia-Singapore Airlines ceased to exist and Singapore Airlines emerged. The iconic uniform has not been without its criticisms however, after many called the ‘Singapore Girl’ marketing concept sexist. However, for a uniform that has stood the test of time for over four decades, the airline has no plans to change the concept or their traditional uniforms any time soon. 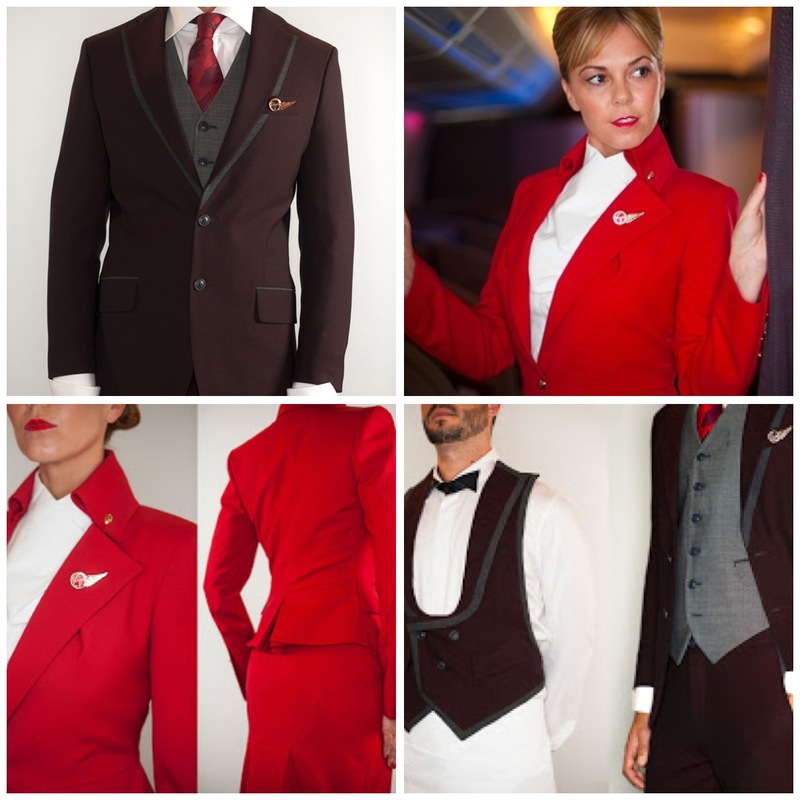 No uniform list would be complete without including the stunning offering from Virgin Atlantic. The airlines previous iconic uniform pictured above, was created by British designer of the year, John Rocha in 1999. Rocha kept the traditional ‘Virgin Red’ and introduced their classic purple and red neck scarf. Initially, the designer decided to do away with Virgin’s signature red heels. Thankfully, after many complaints by crew (and sexually frustrated business passengers) the iconic shoes returned in 2004 when Rocha was once again hired to vamp up the previous design, celebrating the carriers 20th anniversary. Although the uniform has been around for over a decade, it still looks as stylish and iconic as it first did back in 1999. But, in 2013 it was revealed that Virgin would be teaming up with punk fashion powerhouse Vivienne Westwood to completely over haul the crew and airport staffs look. Both Westwood and Virgin have always been known to push the boundaries and their collaboration for the new uniform is no exception. All 22 uniform pieces have been designed with the environment in mind, with many items produced using recycled materials – in particular a recycled polyester yarn made from used plastic bottles. The suit fabrics also have a nano finish which extends their life and enables the clothes to retain their colour and finish for longer. All items were also developed with Closed Loop Recycling – a new technology which takes worn polyester clothing and turns it back into fibres that can be woven again into new fabrics. It is clear from the designs that Westwood has put her stamp on the new pieces, mixing the ornate silhouettes she is famous for with traditional British heritage. But for me, as a male crew member and fashion junkie, it is the exquisite re-design of the mens uniform that has won me over. The three-piece Saville Row inspired burgundy suit, with innovative fake label detail on the jackets is simply stunning. For the girls the scarf has been ditched and the collar has been raised. Hour glass designs feature in the new pieces and the infamous red shoes have been redesigned with a non-slip sole for added comfort; well Virgin girls do walk on average 7 miles per flight. 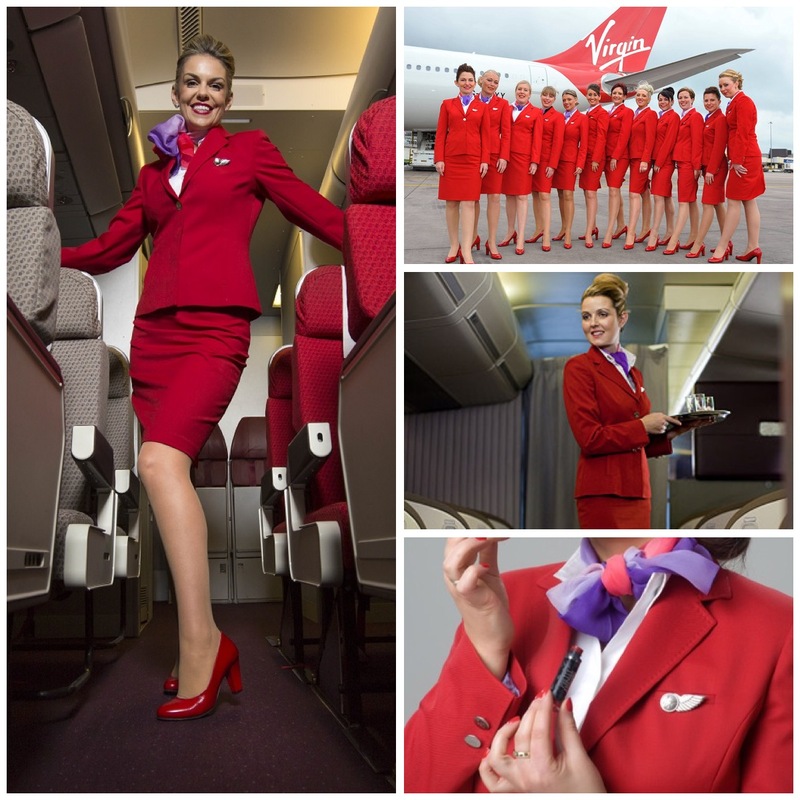 For a number of years Virgin Atlantic’s uniforms have been put together by Incorporatewear, one of the biggest uniform suppliers in the UK. The company creates uniforms for some of the biggest airlines in the UK including Virgin, easyJet, Thomson and Thomas Cook. Speaking about the company, Loraine Manning, Virgin Atlantic’s Indirect Services Category Manager said “Incorporatewear impressed us with their attention to detail, and customer focussed approach, which we feel aligns perfectly with Virgin Atlantic’s core values”. You can also find more information on the fabulous Virgin Atlantic by heading over to their ‘Flying in the face of ordinary’ picture gallery. Or want to know more about what its like to be a Virgin hostie and wear that iconic red uniform? Then check out our Virgin Atlantic – ‘A Day in the Life‘. For many years, Aeroflot haven’t exactly been the epitome of style, sophistication or glamour. But all that changed when in 2013 the Russian carrier launched their fabulous retro-inspired, bold orange-red new uniforms. Female crew sport iconic hats and white gloves, harking back once again to the Jet-set era; with wing-collared shirts and orange-red suit jackets to complete the look. Meanwhile, male stewards are kitted out in a stylish dark-blue suit. 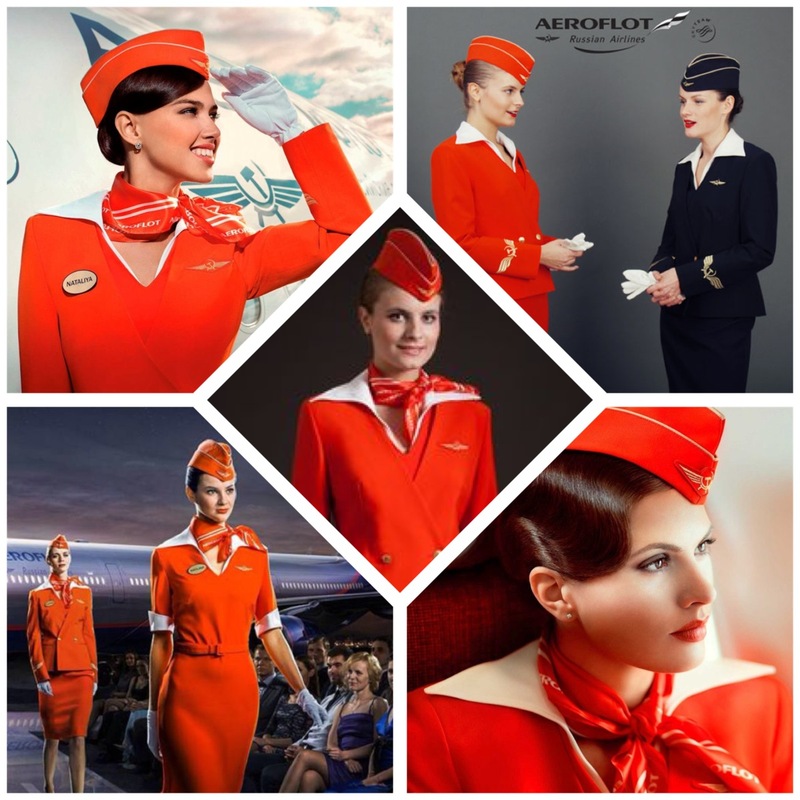 The uniform is designed by Russians Yulia Bunakova and Yevgeny Khokhlov, who went on to say “Compared to uniforms adopted by European air companies, Aeroflot boasts decades-long traditions. By designing a new uniform, we wanted to maintain the traditions”. And the pair have done just that, resurrecting the companies legendary winged hammer and sickle logo, which was dropped in the early 2000s. Gianfranco Ferre, often described as the ‘Italian architect of fashion’ was chosen by Korean Airlines to redesign the uniform in 2005. The stylish and elegant ensemble is made up of numerous pieces in the airlines signature white, cream and celadon blue colours. While elegant and refined, the uniform is designed to be practical and comfortable, with much emphasis placed on attaining a harmony between global fashion appeal and a foundation of Korea’s traditional and inherent beauty. 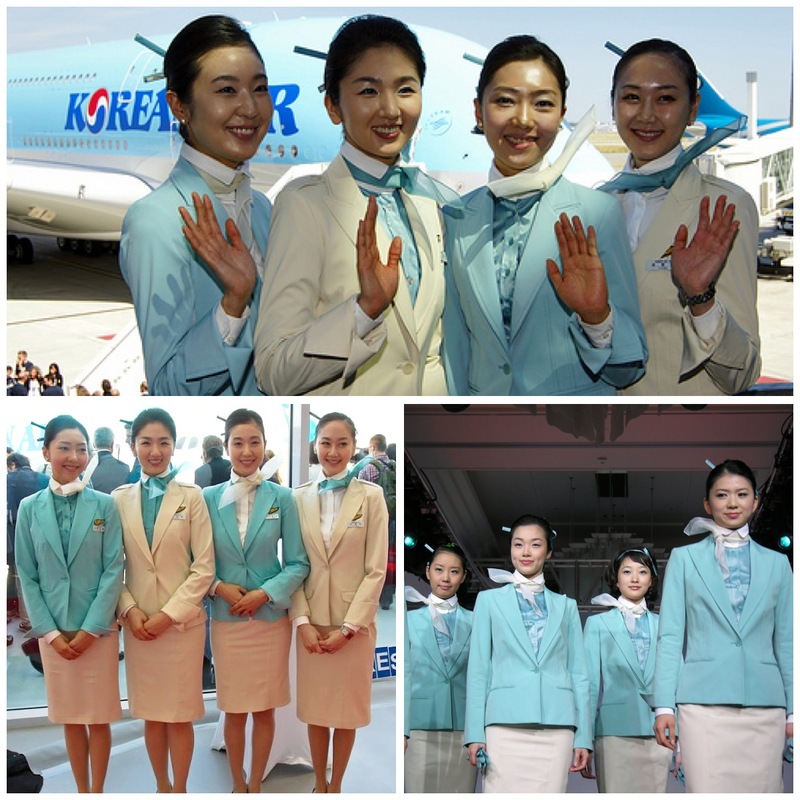 If ever you’ve seen Korean cabin crew, I’m sure you’ll agree that the designers achieved just that. The most coveted and desired piece of this uniform, has to be the gravity defying scarf. Stiff and tied snugly around the neck, one end is styled to take flight away from the neck as if on a wire. It truly is a piece of fashion art. 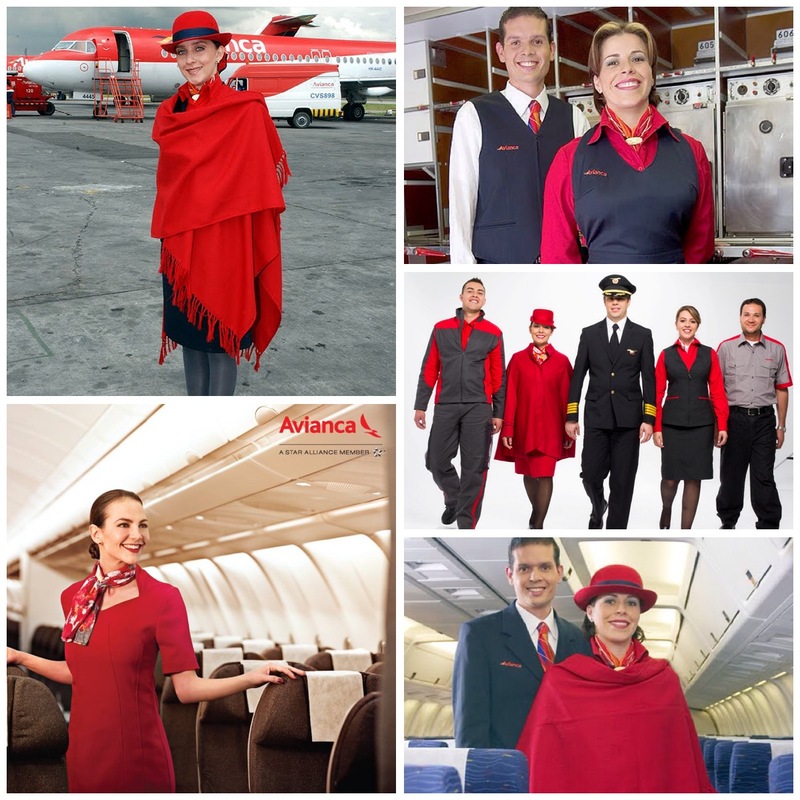 Early in 2013, Colombian national carrier Avianca completely re-deigned their brand, from aircraft liveries to cabin crew uniforms. The refresh was pretty spectacular, harking back once again to the jet-set era and ‘Bringing Back The Glamour’. Created by Colombian designer Alonso Uribe the uniforms were chosen for their ‘modernity and elegance, as well as their Colombian touch’ according to Avianca spokespeople. For the female crew fabulous Fedora-style hats and a colourful scarf are wonderful additions, while the red cape reminds us of the airlines early days. Meanwhile the boys have been kitted out in fitted three-piece suits, complete with a colorful tie that matches the ladies scarf. The whole ensemble gives the airline instant individuality. 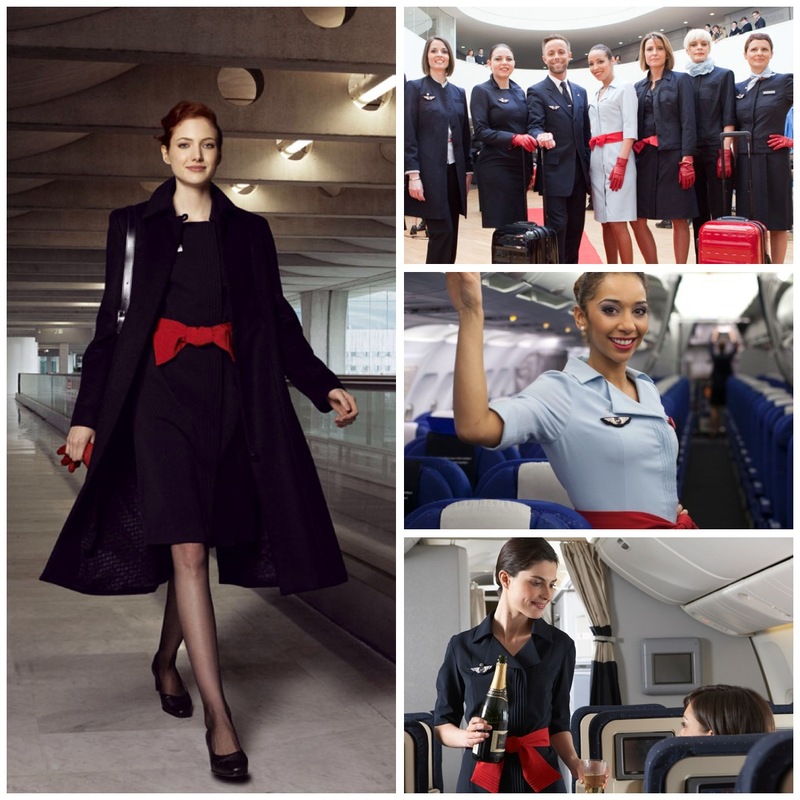 So there we have it, our 10 favourite cabin crew uniforms adorning our trolley dollies during 2014. What other airlines do you think deserve to be on the list? Be sure to send your suggestions in the comments section below. I think Korean and Qantas uniform are one of the most glamourous. Check out SATA Internacional new uniform. A little bit hard to find photos. Emirates and Vietnam Airlines, style plus. Safi Airways new Cabin Crew uniform is also stunning. The mix of royal blue and purple colors make the female crew standout from the crowd at the airport. this is really cool! i had no idea that some uniforms were so chic. Please take a look at Norwegian (long haul )uniforms absolutely gorgeous..
Air New Zealand anyone? The uniforms are great! Definitely Air New Zealand they look amazing so smart! AIR NEW ZEALAND!! those uniforms are gorgeous! Green like the flora and fauna! pink like the sunset! and blue like the pacific ocean that surrounds us! Trelise Cooper is probably one of the worst fashion designers in the industry. I have had the pleasure of flying both Qantas (long-haul) and Virgin Australia in the past week. Loved the uniforms of both airlines! I have had the pleasure of flying both Qantas (long-haul Aus/US) and Virgin Australia in the past week, and I loved both uniforms! I cannot share all your choices…probably because I don’t have all of them. Definitely by far my favouries are Qantas & Korean Air. Both styles show flair, class, glamour & style. Love the blue color for Korean Air & the Fruisha pink & red for Qantas. Very clever Qantas the red representing the red tail of the aircraft. Verder hebben we het besluit om voortaan het budget dat normaal wordt besteed aan relatiegeschenken te besteden aan goede doelen gezamenlijk genomen. I work for BA, the Male uniform is awful to wear. We have to wear the trousers 2 sizes too small to show our bums off. 99.9% are happy as gay boys love being ho’s and showing their bums, but for the straight boys we hate it! What about new Alitalia uniforms ? Korean airlines takes the cake, if you’ve ever flown in one. Anybody (males0 reverse tie your tie to make it look skinny?